In this third post in a series on Latino startups, Oxford SBS Seed Fund co-founder Mark Hand highlights the Latino market startups on the path to startup success. Check out the first and the second posts in the series, too. When Peter Wilkins of New Futuro set out to raise a round of venture capital this year, he found very few investors that understood his target market: US Hispanics. In the VC community, he still says, "there is no one that I know of focused on Hispanic market companies." That lack of understanding on the part of investors hasn’t slowed down New Futuro. Through its events, resources, and online community, New Futuro now provides educational advice and material it says reaches millions of Hispanics every year. In the footsteps of companies such as HolaDoctor, Xoom, Progreso Financiero, and Consorte Media, New Futuro is part of a new crop of Latino market startups that are raising cash, building teams, and charging into the Latino market. The most active sector for Latino market startups is financial services. Regalii, led by Wharton MBA and Echoing Green Fellow Edrizio de la Cruz, follows in the footsteps of iSend in allowing families to have some a say in the spending of remittances. Currently in beta launch according to its website, Bucks Bill Pay allows customers to pay their bills in cash at local agents. And Juntos Finanzas, a product of Stanford d.school, empowers Latino customers to track their own expenditures by SMS, similar to India-based social enterprise InVenture. Along with New Futuro, another crop of Latino market startups focuses on education: YogoMe is an educational app with plans to move into language learning. Backed by 500 Mexico City (which announced its new batch of startups just last week), YogoMe is one example of how companies are pulling in resources from both American and Mexican startup ecosystems. Sleek-geek has three educational tablet apps for teachers, and is one of seven companies in the first Manos Accelerator cohort that includes Antonio Altamirano's Interesante. Plaza Familia is another educational venture founded by Latino social media veteran Ana Roca Castro. Beyond financial services and education, immigration services platform LexSpot has raised over half of its $750,000 convertible seed round. YaSabe, another 500 Startups portfolio company building a bilingual, local search engine, closed a $2.7M funding round in the first half of 2013. AssuredLabor, based in NYC and with operations in Brazil and Mexico, raised $5.5M earlier in 2013 to expand its job-seekers platform. Keep an eye on these companies in 2014--no doubt at least one of them will soon stand with Xoom and others that have built successful businesses by serving a large and growing US Hispanic market. Who did we miss? Let us know in the comments. A couple of notes: iSend is a portfolio company of Gray Ghost Ventures, Mark's former employer. Also, thanks to Barney Santos from Gentefy Media for his help in pulling this list together. The Latino Startup Alliance, created to encourage the inspiration and cultivation of U.S. Latino led technology startup ventures by providing a strong support network of fellow entrepreneurs, investors, innovators, & mentors, is hosting their 1st annual Innovator Summit at the Mission Bay Conference Center in San Francisco. The 1st Annual summit in San Francisco that brings together Latino tech entrepreneurs for two days of startup pitches, keynotes, lighting talks, workshops, networking, and the fostering of both partnerships & friendships to help support Latino startups globally. The LSA Innovator Summit will focus on three principals: Access, Acceleration, and Awareness. This summit will be the catalyst in providing a platform for startups, entrepreneurs, investors, and partners to connect and take action. The Latino Startup Alliance is holding an open invitation where startups can apply to pitch at the upcoming Innovator Summit. With a robust set of partners like the Kauffman Foundation, Latinas Think BIG, Lean Startup Circle, and many others, the LSA Innovator Summit is a landmark event playing front and center in today's "Latino Tech Moment." 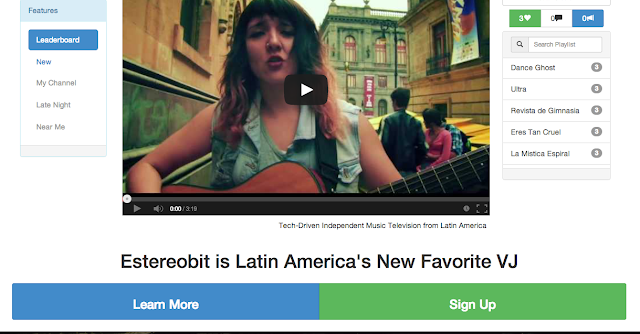 Latino Startup Estereobit.tv delivers hip music videos and real-time interaction to musicians and fans of Latin indie music. Estereobit.tv brings back the nostalgia of watching music videos while using the most up-to-date technology and taking on an international mass appeal. AUSTIN, TX—Estereobit.tv is an early-stage Latino startup that provides music lovers with a music video jukebox in the cloud. Along with tapping into the deep nostalgia people have of music videos—remembering the heyday of MTV—Estereobit.tv is the trusted source of the latest hits in Latin indie music. Estereobit.tv goes beyond the normal music app by building their collection in the cloud, giving users access to their personal music video collection at any-time and anywhere. Imagine spicing up a dull party by having your music video collection handy online or even from your phone! With the limited resources and competition for the limelight, new artists don’t always have a way to reach their audience; Estereobit.tv gives musicians a better platform from which to reach their fan base and easily promote their music to their target market. With a lack of industry attention towards international and Latin music here in America, Estereobit.tv lends itself as a simple and direct distribution channel for Latin music fans around the globe. Estereobit.tv is a free music app available to users via www.estereobit.tv on their web browsers and mobile devices. Presents trendy, curated music video collection and personal playlist built in the cloud. Gives users access to their personal collection from anywhere on their mobile devices or web browsers. Like videos from a curated video collection and add them to your personal playlist. View the latest videos from indie pop artists from Latin America. Vote for videos and track the real-time popularity of a video on the ‘Leader Board’. Quickly find your favorite videos and add them to your playlist with the quick search feature. Currently in development, Estereobit.tv is working on a live Twitter feed for each band, to be displayed on each music video page. Also in development, ‘Late Night Channel’ where it displays the top dance music videos and a list of nearby clubs or concerts near the user location. Founder, Ulises Ramirez-Roche first thought of Estereobit.tv because he missed regularly tuning into a music video channel and saw the need for a promotion source for Latin music in the United States.